On your mark, get set — GO! I set the alarm for early to run the route I would be leading our pilgrims through Assisi and to get a four-mile run in before the rest of the group got up. I wanted to cover four miles and did a bit more. Assisi is one of the most beautiful cities in the world. Medieval with gates, stone walls, banners, flowers, churches, a fortress and tile roofs. It is quaint and stunning — candy for the eyes. I ran through the life of St. Frances — his birthplace, his family home, the “prison” where his father constrained him. I also ran to the church named after him and past his tomb. “No fotos, no fotos!” but in the morning it is always allowed, since no one is there to yell at you. Down the valley is the Church of San Damiano where the “St. Damiano Crucifix” spoke to Francis and said, “My church is falling into ruin. Repair my church.” Francis thought he meant the little porziuncola in the valley. He realized later that God meant his universal Church. 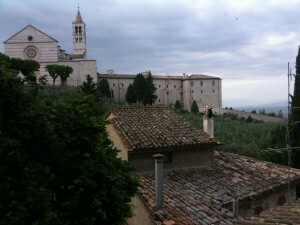 These sites are all within hiking distance in Assisi. From time to time I am asked whether priests need special faculties to absolve penitents in abortion cases. Although the 1983 Code, in contrast to the 1917 Code, requires no special confessional faculties in abortion cases — and therefore any priest authorized to hear confessions can absolve from the sin of abortion and from the automatic censure attached to it — confusion on this point apparently persists. So let’s address it. For the 116 pilgrims flying to Israel to join us tomorrow, and for their families and friends, do not worry — despite what you hear on the news. We are here in Jerusalem and all is quiet and business as usual. We anticipate no problems and expect a profoundly spiritual, safe and blesses time together exploring and praying at the Holy Sites! Keep an eye open for my daily Virtual Pilgrimage Videos right here on my blog.